Thanks to Miracle Flights for another successful trip! Well, one more trip to Florida accomplished. It was full of action. It didn’t seem like it was only nine days. It felt a lot longer. Sunday we made our way to Nashville for an early flight out. Exhausting it was. But, we made it. We picked up our rental car and made a bee line to our hotel for a well-deserved night of relaxation. 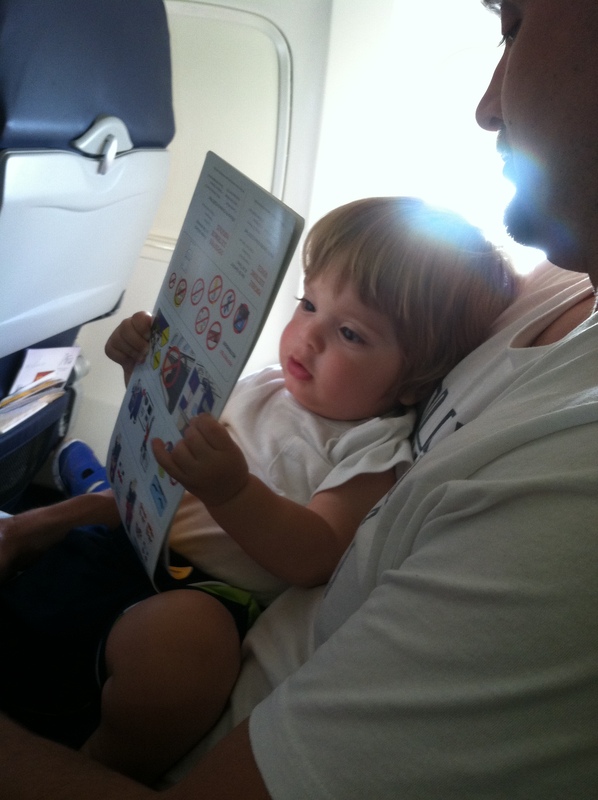 It’s important for all fliers to be familiar with safety protocol whenever flying. We hadn’t been in the hotel for long before the power abruptly went out. It was a little disconcerting, but it was close to bedtime so it actually helped expedite the negotiation process that Drew attempted to acquire more TV time. Come to find out, over 1000 people in that area was out of power. Luckily, it was back on in a few hours or so as it so rudely woke me up with it’s sudden brightly illuminated room. Monday wasn’t short of surprises either. 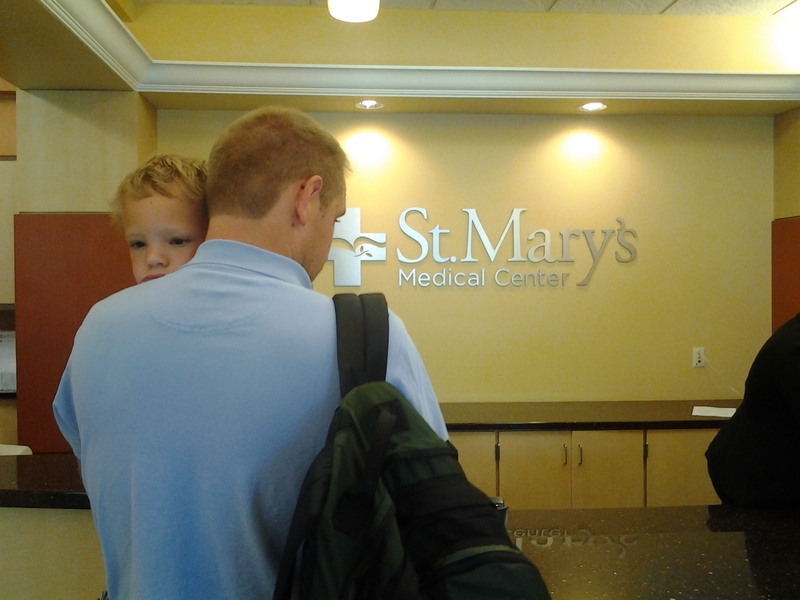 We were scheduled for a pretty early pre-op in which a much dreaded blood draw was administered. Then it was off to see Dr. Paley. 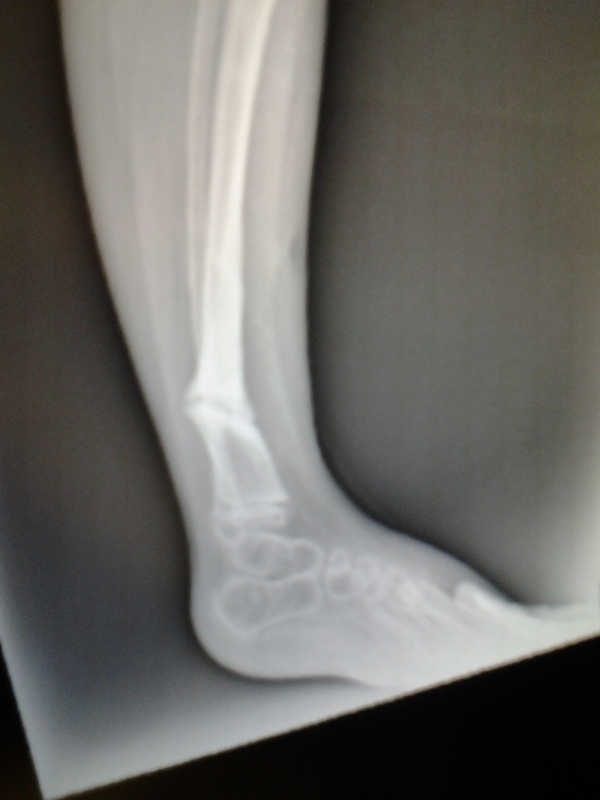 We had been anticipating a surgery on Drew’s lower left leg just above the ankle to correct a fracture. 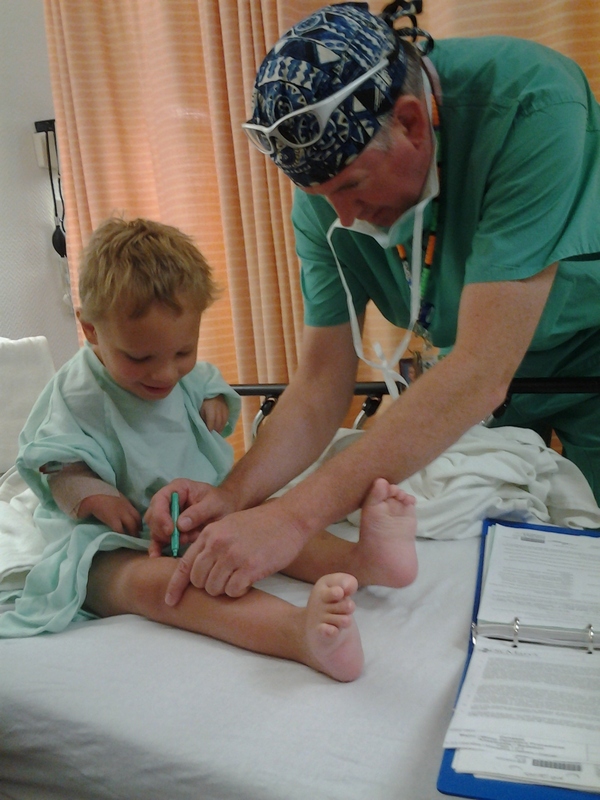 Dr. Paley explained that in prep for Drew’s surgery he had reviewed all of Drew’s previous x-rays and it appears that the osteotomy (sawing in half of the bone) he performed while placing the fixator never healed so he’d place an internal fixator over the fracture to promote healing. It was previously thought that Drew had fractured his bone in some type of injury so it was a relief to know that I wasn’t a neglectful parent after all. 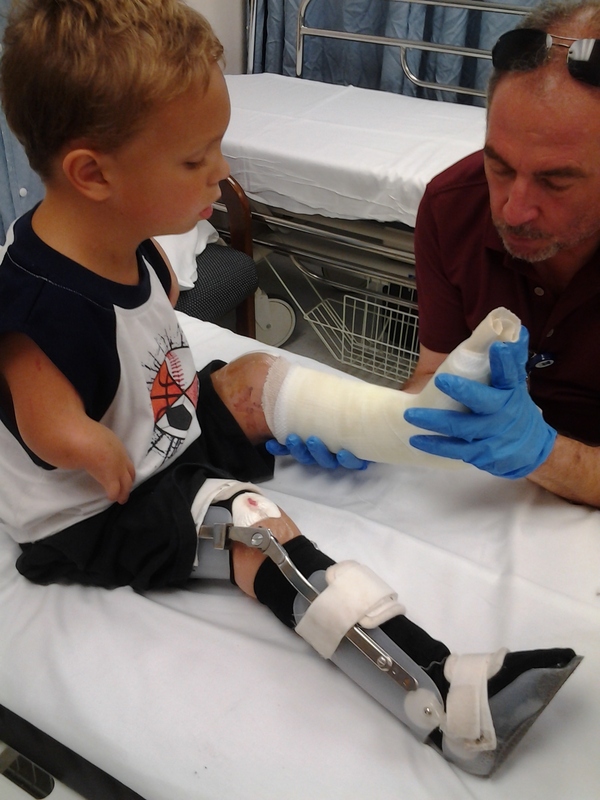 But then Dr. Paley surprised us by adding that Drew could benefit from some correction to some curvature of each of his femurs so he planned to install what’s called an “8-plate” on each femur. We went from one surgery on one leg to three procedures on both legs (internal fixator to repair fracture, 8-plates on each femur, and removal of a rod that was placed July 2013). We were scheduled for a relatively late surgery as we didn’t have to be at the surgical center until 8:30 am. This is a late start for us as we’ve always been scheduled around 6 am. Of course, Drew was NPO (no food or liquids) since midnight the night before, so imagine his distress as the day grew later and later waiting for them to take Drew back to the OR. 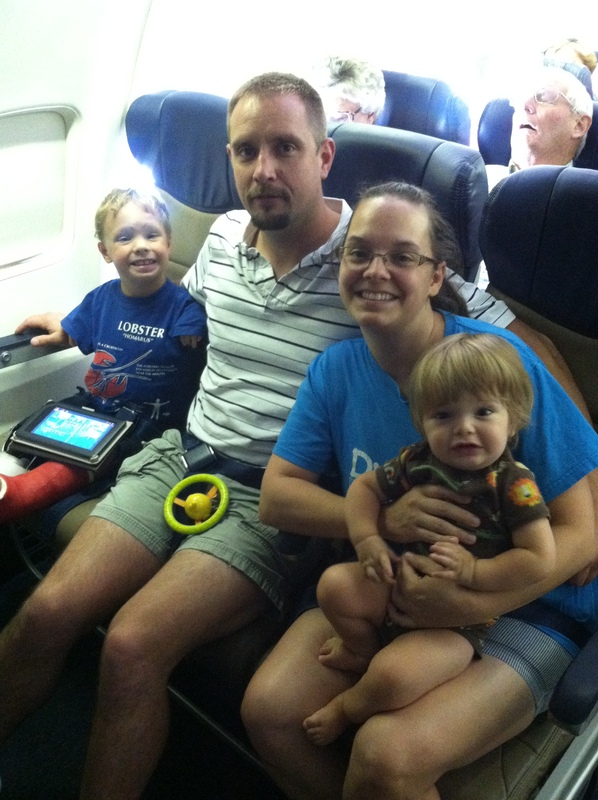 It was a full 7-hour wait with a grumbling tummy before they finally called Drew back. A 7-hour wait in clinic can be expected, but having to fight hunger along with boredom was excruciating. I had never felt like a bigger failure than when I had to leave Daddy to wait with Drew so I could make myself comfortable as I was struggling to keep Holden in good spirits. I felt that if Drew had to put up with a long wait, I should be by his side the whole way. I didn’t even get to hug him immediately before he went back. I hope my earlier hug and kiss would suffice. The surgery was over with in a couple of hours. The hardest part is the wait to see Drew after hearing that the surgery is over. Minutes can’t go by fast enough while we wait to finally see Drew. He was in a pretty good amount of pain, but it was managed. Before long he was moved into a room at the hospital where he rested for two days. He had a “soft cast” on his left ankle, just below the knee that would remain until swelling decreased allowing a permanent cast to be placed. During this time he also had a blood transfusion due to low hemoglobin. After two days of observation, he was discharged. We checked out a wheelchair fro the PT department now that Drew was on strict orders to not bear any weight on his new cast, picked up a pain medication prescription from the local pharmacy and settled into our hotel room. Drew was pretty sensitive so we didn’t do much for fear of causing him additional pain. 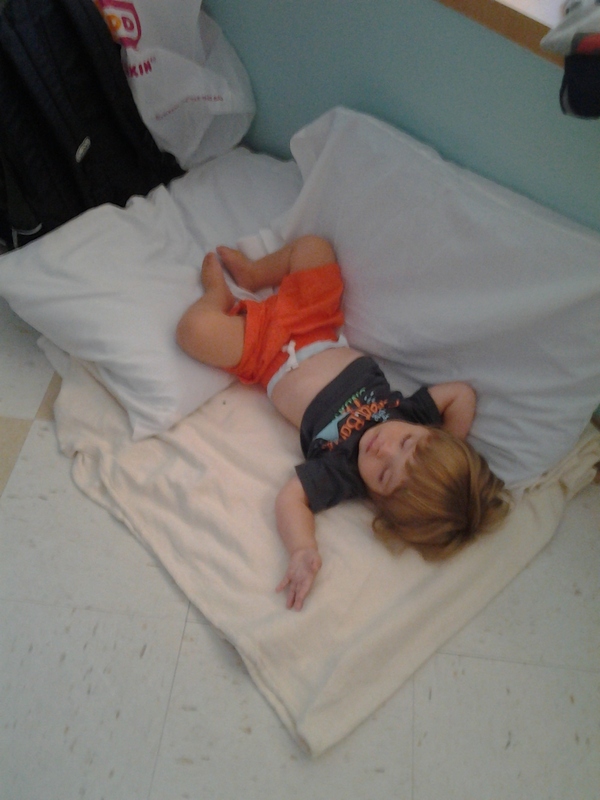 Going to the bathroom was a little of a hassle now as he’s just not quite as easy to maneuver. Nights were rough with frequent episodes of pain and discomfort. Things were a little out of sorts for us. 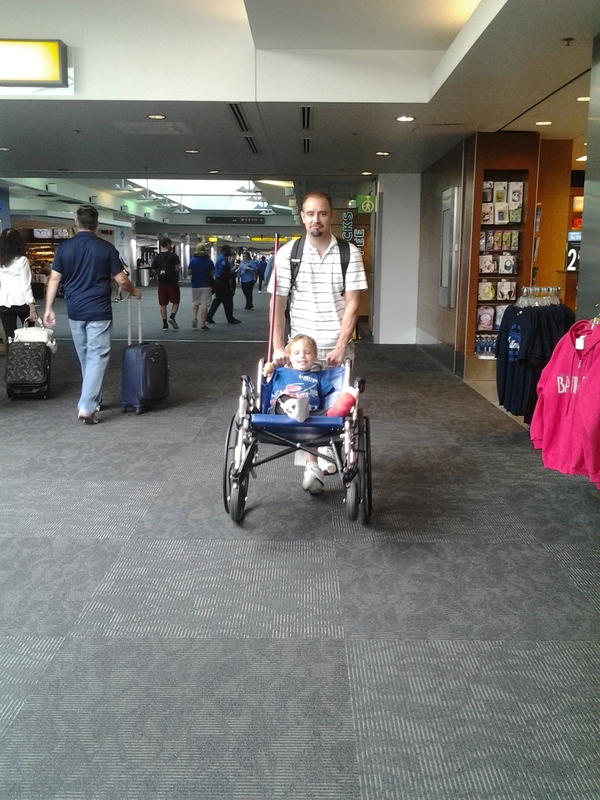 Drew’s surgery was more extensive than we initially planned for, he was no longer able to walk and just being away from home is enough to throw anybody’s routine. Our disorientation was evident in the fact that I managed to accidentally lock Holden along with the keys in our rental vehicle. On a hot day. With the windows rolled up. Immediately I called 911 and the fire truck came sirens blaring. I was a nervous wreck and after 30 minutes of being trapped in the vehicle, they managed to finally shimmy the door unlocked. 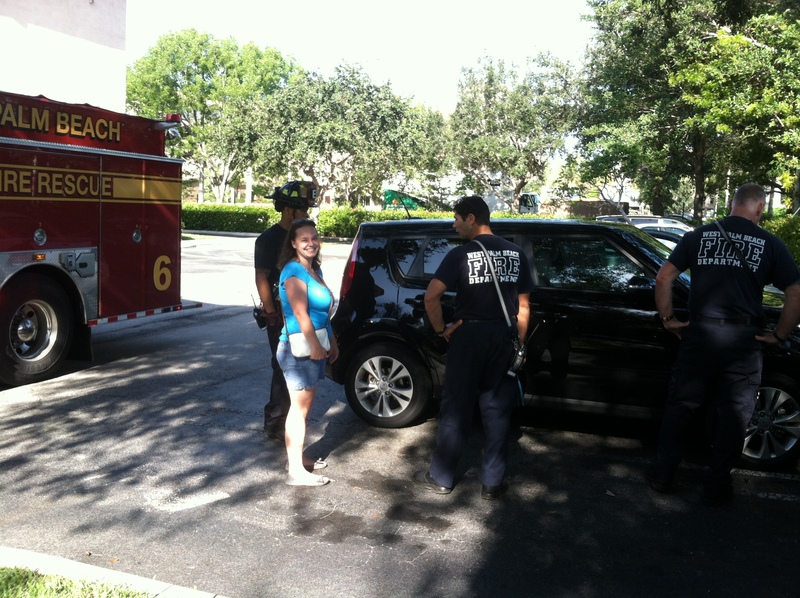 Thanks again to the WPB Fire and Rescue for rescuing my baby! 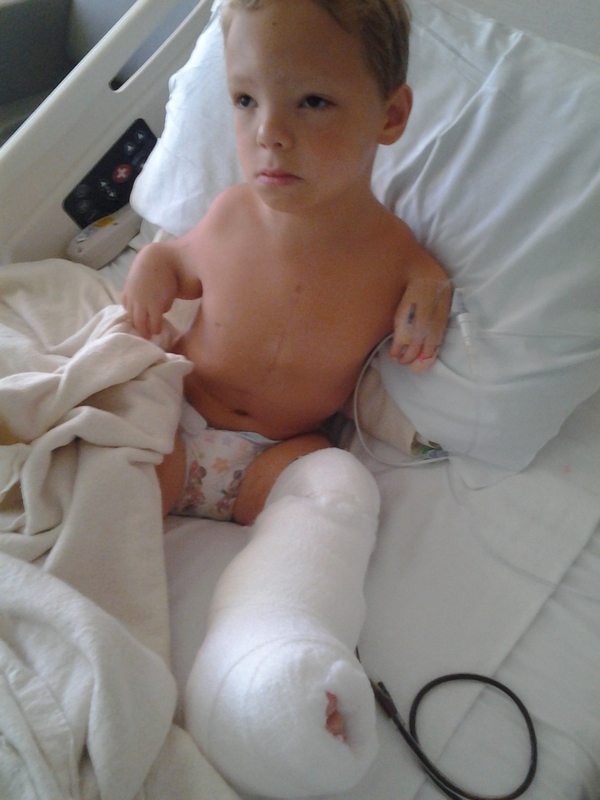 Friday Drew’s cast was removed and a hard cast was put on. But on Monday, as feared by the technician, the swelling still present in his foot had decreased causing his foot to slip in the cast so much to Drew’s terror and adamant protests, the cast was sawed off and a new one fitted. I’m almost positive that the technician had a strong drink at home after that very aggravating encounter with Drew. All in all, it was an OK trip. Drew came through surgery healthy. Though we never made it to the beach, and only got one day of swimming in the hotel pool the day before the surgery, we did manage to get Drew on a sightseeing tour around the city on the Diva Duck bus/boat. He saw a move in our favorite downtown locale and we treated ourselves to some yummy gelato at our favorite Italian eatery. The trip home was pretty routine. Routine for a family of four travelling every 3-6 months across country for surgery and follow-ups that is. 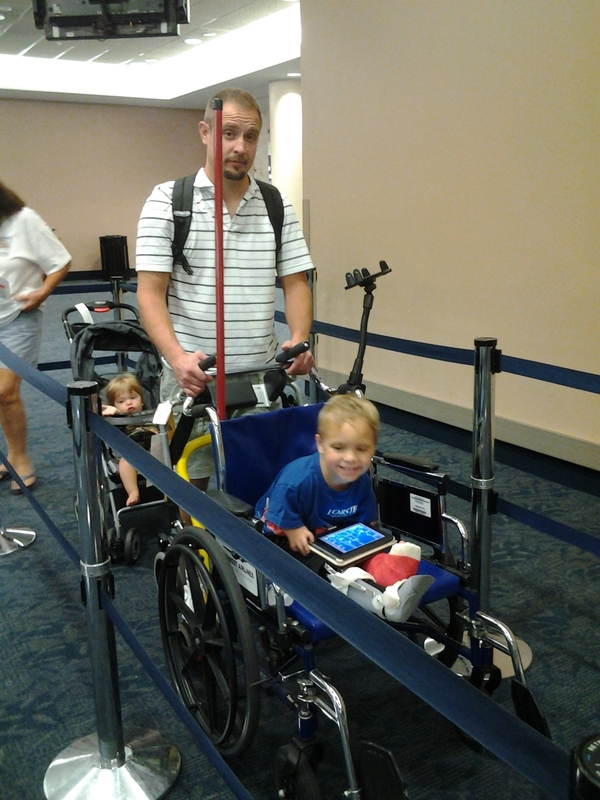 We’re glad to be home though our daily life is different now that Drew is restricted from walking. Just when we get used to his independence too. It seems as if everytime we make some progress forward, we’re set back a few steps. Anyway, it’s taken me three days to complete this post due to an overflowing abundant garden producing vegetables at a pace that I can barely can fast enough to maintain a clutter-free kitchen and Holden seems to be quite the needy baby with fewer tendencies to entertain himself as is typical. Such is the life of a mom of two boys! Next Post Pain, Pain, Go Away!